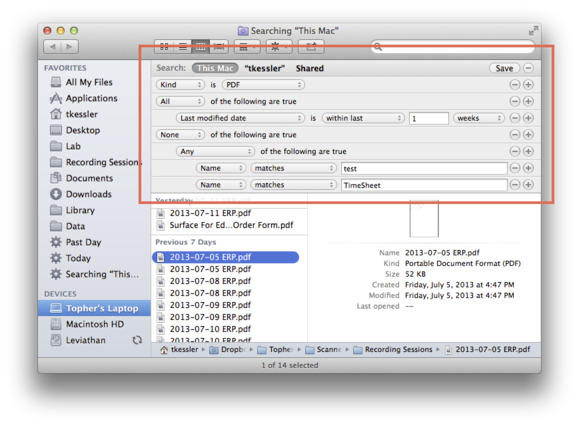 For some users, “organizing files” in the Finder begins and ends with creating folders and moving files into them. But there are a bunch of other things you can do to manage your files in OS X that, whatever your workflow, will make things way easier. When performing Finder searches, you can use multiple criteria to narrow your search by clicking the Add button (+) at the top-right (next to the Save) then adding more criteria. You can use the drop-down to select specific metadata tags for narrowing your search; if you don’t see the ones you want in that list, you can also choose Other to choose from many, many more. By holding the Option key when adding search criteria, you further refine your search by more complex logic. By default, when you add new criteria to a search, the Finder will do so with And logic, meaning that files must meet all of the criteria to be included in the results. However, you might wish to specify files by excluding some criteria—by using a Not logical statement. You can implement such advanced search logic by holding the Option key down when you click the plus button to add a new criterion. When you do so, the new criterion will appear with a second line before it, which gives you the option of Any, All, or None, to specify how the new criterion (or additional criteria) will be handled in the new search. Another common frustration is when you have too many files in a folder. You can always rearrange and resort the files with the Finder’s view tools. But it can be more useful to arrange related files into subfolders. One way to do this is to create a folder and then drag a selection of files into it. But it’s quicker to select the files you wish to group, right-click them, and then choose the New Folder Containing ## Items where ## is the number of items you’ve selected. 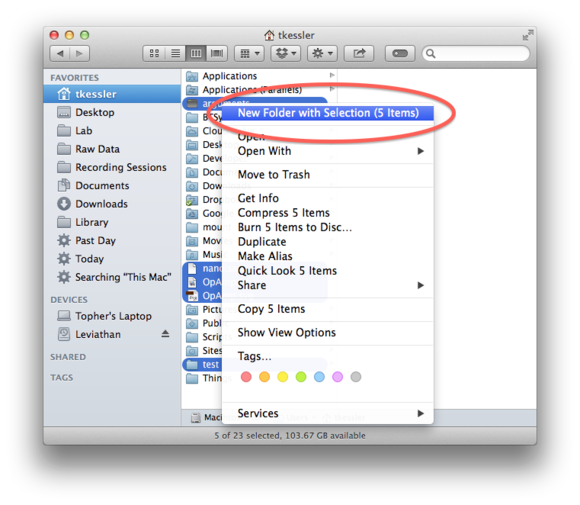 Right-clicking any selection of files in a given Finder window will allow you to consolidate them within a new folder. Unfortunately, this feature is limited to selected files within the current directory, so you can’t use it on search results that include files from multiple folders. The workaround: Run your search, then select and drag the results to a new folder. While Spotlight is the primary search option for OS X, you might find yourself using it only to find and open files directly in their default applications; many users forget that they can also use it to reveal files in the Finder. To do so, run your search, then use the arrow keys to highlight your desired file. Next, instead of pressing Return key alone, hold down Command key as you press Return. This will open a Finder window containing the file, and allow you to delete it, move it, open it in a non-default application, or otherwise manage the file directly. Finally, if you’re tired of navigating your file-and-folder hierarchy the old-fashioned way (by clicking on successive parent-and-child folders in the Finder), there’s a quicker way to navigate: If you hold down the Control or Command key while you click on the little file icon at the top of document or Finder windows (or if you just right-click on it), you’ll get a drop-down with the file’s path. If you then click on one of the folders in that path, that folder will open in the Finder, with the appropriate child-item selected. Right-clicking the title of a saved document will reveal its location on disk. So, for example, if an open document resides in your username/Documents/Work folder, you can open that drop-down and select, say, your own home folder in the path menu. That will open that home folder in the Finder, with Documents folder is selected. Likewise, if you select the Documents folder from the menu, then it will open that folder in the Finder with the file itself highlighted. This last option is a quick and easy way to reveal a file on disk, so you can email, move, or otherwise manage it.